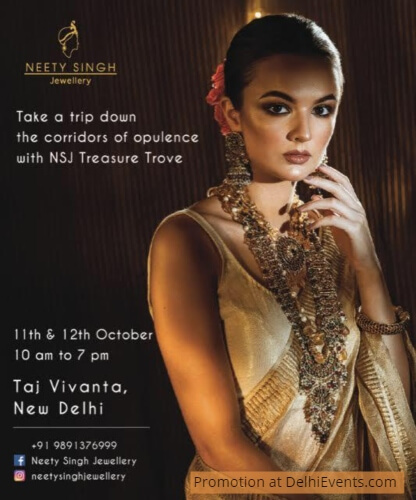 About Neety Singh :She has experimented with traditional jewellery, reinventing it, to a bold and modern avatar. Each piece is painstakingly crafted and stylized in a refreshingly unique manner, creating a priceless masterpiece that is Indian in origin but universal in appeal! The collection is a tribute to the urbane Indian woman, therefore ranges from classic and understated to bold and bohemian! Neety draws inspiration from bejeweled Mughal Prince and Princess and their beautifully rich, intricate Polki, Meenakari, Kundan and Jadau jewellery, but blends it with an urbane sensibility creating a truly eclectic piece with her uninhibited approach to design and craftsmanship.The superb use of precious stones like Ruby Red, Emerald Green and Sapphire Blue blended with lesser used precious stones like citrine, amethyst and peridot creates an heirloom that is distinctly and daringly different!